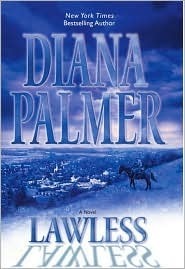 In author Diana Palmer’s novel, Lawless we meet Christabel Gaines and Texas Ranger Judd Dunn. When Christabel was just 16 years old her father beat her, luckily Judd came on the scene and got him offer her and an ambulance called. After Judd got her father put in jail he married her, in name only, to save the ranch they both shared. Now at 20 Christabel wants more than a platonic relationship with her husband but he is determined that once she turns 21 they will get the marriage annulled. Still though he can not help the feelings he is starting to get for her as well, especially when she stars showing interest in a new man. But even now with the feelings being realized it may be too late. . . I really enjoyed this novel—it was one of my very first Diana Palmer novels and cowboy/ranch novels so it left a very big impression on me. In the novel Christabel and Judd are in a bind with the ranch and they need money so when they get an offer from a film company who wants to use their farm to shoot a movie for a small fortune they don’t really have a choice other than to say yes. In walks the female movie star Tippy Moore who Judd is immediately enamored with. This hurts Christabel because she is in love with Judd but he does not notice her at all other than a dependant he has been taking care of for the last five years. Of course that is not at all how Judd really feels about Christabel but he feels that he is much too old for her and does not want to take advantage of such an innocent. Now, in walks Cash Grier who is a very dangerous man and is very interested in Christabel. Christabel likes Cash as well and goes out with him a few times, but to her they are only friends. Judd however does not see it that way and well knows Cash’s past, he is very angry—jealous—about Christabel going out with him. Pretty much the same way Christabel feels about him hanging around with Tippy. Though Cash was not throwing lies and stuff up to Judd the way Tippy was to Christabel. I really liked both Christabel and Judd even though he made me mad at times for the way he was acting by the end of the book I loved him as much as Christabel. The plot is pretty fast paced and of course we have a bad guy and danger in the air through most of the book as well which definitely upped my interest of it as well. Overall the book was very good and I look forward to picking up Cash’s—who definitely held my whole attention in this book from the time he was introduced—and Tippy’s book ASAP. Even though at first I did not really like her by the end of this book I found myself doing so and I am very curious about her past now not to mention how she and Cash get together. I would recommend this book to anyone who is looking for a good contemporary romance and western novel.